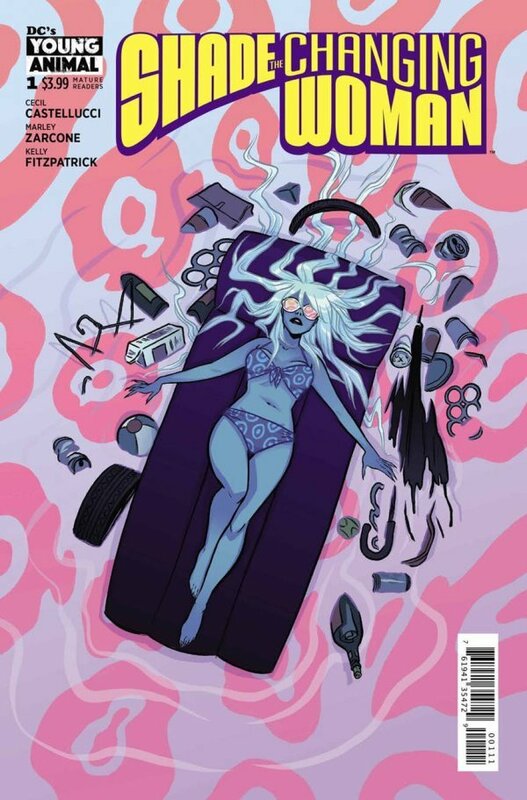 Shade, The Changing Woman #1 Review – AiPT! Splashing out of Milk Wars, Shade’s starting a new chapter of her life on Earth and things are weird as ever. Shade, The Changing Woman #1, though a soft reboot of Shade’s story coming out of Milk Wars and Shade, The Changing Girl, picks up a couple of years after the previous series left off. Loma Shade struggles to adjust to her new permanently human body and all the human emotions that come with it, but does the issue struggle to convey this in an effective way? Not at all! Cecil Castellucci continues to pen a script that reads like poetry while still remaining grounded enough to let her characters feel real and nuanced. With Shade’s newfound humanity comes a broader look at the human behavior than the teenaged-focused Changing Girl. Shade’s a woman now, and the series is touching on more adult topics like polarized political views and unhealthy beauty ideals. The Changing Girl was an affecting series about the adolescent pains of finding one’s place in the world and The Changing Woman carries those ideas over seamlessly with a more adult feeling throughout. The plot doesn’t move very far in this issue, as it is filled with more reflection than action, but I’ve never come to Shade looking for bombastic action and Castellucci does a great job setting up what all the characters are looking for in the new series. Just like with The Changing Girl, Marley Zarcone and Kelly Fitzpatrick kill it on lines and colors. The art is just as trippy, bright, and faithful to style as it has ever been. There is a gorgeous spread in this issue that uses a holographic, pixelated effect seen throughout the issue that complements an End of Evangelion-esque visual from Zarcone’s line work that blew me away. There are several other effects used throughout the issue, like wavy blues on a screen or Ben-Day dots and checkerboard patterns adding extra layers to the panels and elevating their trippy feel. I only want Shade to get weirder and weirder as Shade gets deeper into the madness and as long as this art team stays together, I know they’ll continue to deliver. If there’s anything the issue can improve on, it’s that it didn’t feel like Saida Temofonte has a ton to do in this issue. Her narration boxes fit the style and dialogue is clean and consistent throughout, but I’d love to see some crazy lettering to go along with the psychedelic art once the scripts call for more action effects. The backup feature to this issue, “Menagerie: Gan,” complements the main issue’s psychedelic feel, but delivers a twisted, bad trip that’s upsetting and insane. Jamie Coe takes the trippy feel of the series and delivers haunting visuals that feel like they belong in the Shade universe while feeling uniquely his own. I’m not often grabbed by back-up features in comics, but Castellucci and Coe provide a different flavor of madness that makes me as eager to see the next issue’s back-up as much as the main story. Shade, The Changing Woman #1 is both a strong start to the new series as well as a great continuation of Loma Shade’s story. When the issue ended, I immediately wanted more. Shade, The Changing Woman is a comic you can let yourself sink into and get really introspective and weird with. Definitely grab this one if you’re new to Shade or eager to get the next chapter of her story. A poetic, reflective script and trippy art make this issue a must get for fans of the previous series and anyone looking for something completely unique. Cecil Castellucci’s writing is dreamy, affecting, and left me eager for more. Marley Zarcone’s line art is as trippy and weird as ever. Kelly Fitzpatrick’s coloring and effects elevate the series’ art to new heights. The back-up feature delivers an extra taste of nightmarish wonder. More could’ve been done with the lettering.